Truncus arteriosus review for nursing students! 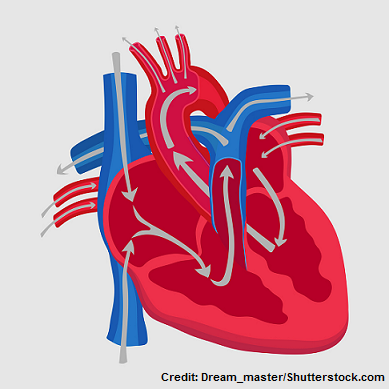 In this review you will learn about the congenital heart defect known as truncus arteriosus. This is a topic you will see on your pediatric nursing lecture exams and possibly the NCLEX exam. 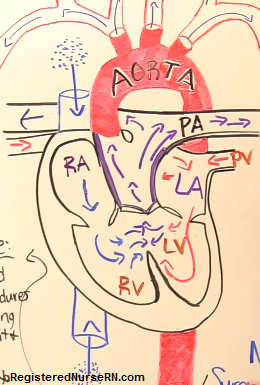 After reviewing these notes, don’t forget to take the quiz that contains truncus arteriosus NCLEX questions and to watch the lecture. What is it? It’s a congenital heart defect where there is ONE artery, along with one truncal valve, that connects the right and left ventricles. It functions to carry blood to both the lungs and body. **In a normal heart, there should be TWO separate arteries (the pulmonary artery and aorta) with their own valves (instead of one truncal valve). The pulmonary artery will carry blood from the right side of the heart to the lungs, and the aorta will carry blood from the left side of the heart to the body. Let’s talk about the truncus arteriosus…. What is this structure? This is an embryonic structure that normally starts out as ONE structure during development of the embryo that comes off the right and left ventricle, BUT later on during development it should DIVIDE into TWO structures, which we know as the PULMONARY ARTERY and AORTA. However, this fails to happen in a baby with truncus arteriosus. This condition is relatively rare. According to the CDC.gov, there are about 300 cases of truncus arteriosus in the U.S. per year. Most cases of truncus arteriosus are due to a genetic disorder called DiGeorge Syndrome, and this is where chromosome 22 is missing. According to C.S. Mott Children’s Hospital, about 33% of babies with truncus arteriosus have a genetic problem called DiGeorge syndrome (“Truncus Arteriosus | CS Mott Children’s Hospital | Michigan Medicine”, 2012). A ventricular septal defect (VSD) is commonly present in truncus arteriosus. It is rare for one not to be present. This defect will actually allow blood to mix in the right and left ventricle and enter the truncus arteriosus. The un-oxygenated blood (this is blood that has been “used-up” by your body that needs to be resupplied with oxygen) enters to the heart through the SUPERIOR AND INFERIOR VENA CAVA. But in this condition we have some blood mixing issues and overcirculation of blood to the lungs. Blood that is unoxygenated comes from the right side of the heart, and blood that is oxygenated comes from the left side of the heart. In truncus, this blood will mix in the ventricles due to a ventricular septal defect (VSD) and the MIXED blood will enter the truncal artery. Some of this mixed blood will go to the body via the aorta section of the truncus, while majority of that blood will go to the lungs via the pulmonary artery section of the truncus. WHY will most of the blood flow to the lungs in truncus? After birth, when the baby starts breathing on its own the pressure becomes lower in the pulmonary circulation rather than systemic circulations. In other words, it’s easier to pump blood to the lungs than to the body. This may sound like it could work for survival of life, but it doesn’t. WHY? The mixed blood that will go to the body is not richly oxygenated and the body can NOT function with blood that is poor in oxygen. This will cause cyanosis (bluish coloring of the skin, lips etc.) and is due to a low amount of oxygen in the body. In addition, all the extra blood flow that is going to the lungs will damage the lungs overtime causing pulmonary hypertension (the arteries that supply the lungs will narrow), which will lead to heart failure.WHY? The heart will become weak over time trying to pump against the high pressure to the lungs. Furthermore, the increased resistance caused by the lungs will actually lead to less blood flow going to the lungs….hence MORE unoxygenated blood going to the body and this will increase CYANOSIS. All of this can lead to heart failure and even death. If not treated, truncus arteriosus can lead to heart failure within the first 7 days of life. To understand the signs and symptoms easily, just recall the patho and ask yourself “what is going on”? Truncus arteriosus repair (within first 2 weeks of life): VSD is closed with a patch, there is separating of the pulmonary arteries from the truncus arteriosus and they are connected to the right ventricle using a valved conduit.